These are just two of the extensive range of eight different Quail Pens that we are importing from Europe. The first one is a single bench top or table unit priced at AUD $99.00. You can also get a double and triple bench top unit. 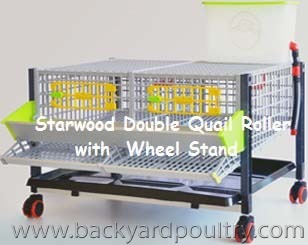 The second picture is a double unit, which is set on wheels, and priced at AUD $225.00. These are also available as triples. Prices exclude freight from Gold Coast to your particular area. They come unassembled in a flat pack and are quite simple to put together. Full written instructions in English are included. Each features a rollaway egg system, an inbuilt watering system, front easy-reach feeding system, and the important aspect is that they are so simple to maintain and clean. Others within the range will arrive soon and prices will be added at a later date. We hope to have more stock as late Christmas gifts for the quail person in your family. Our little website is almost ready to be launched which shows many more of our exclusive European products. 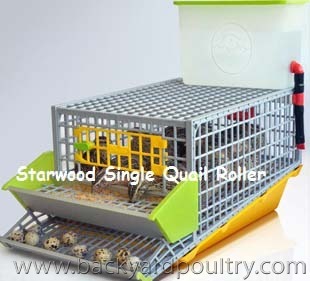 A few people have asked us for the dimension of the Single Quail Unit. They are 34cm wide x 63 cm deep x 14cm high. With the water tank added it brings the height up to 43cm. They are ideal for a desk top or a table top. From our Facebook entry, we just had a Chinese lady order four (4) single units for gifts for her grandchildren for Christmas which is a great way to teach kids in suburbs a little about poultry raising in a city area. They live in a built-up area at Sunnybank, Brisbane.